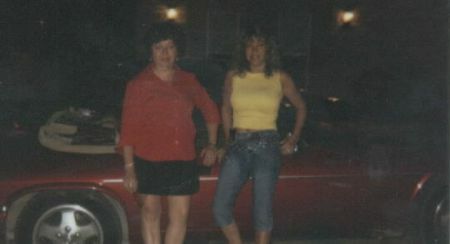 This is outside my home in 2002. My sisters pose for a picture outside with my brother in law's car. When my sister returns to her home in Ohio she has the film developed and this child came out in the picture. I can't see any kid. You can see a face on the bottom right at their hip level. 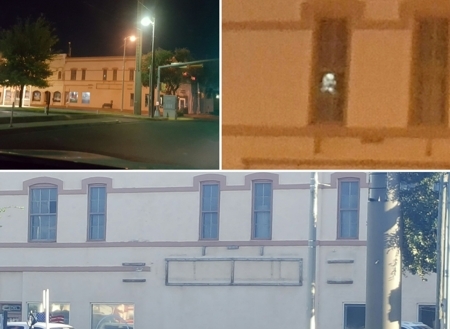 I can see ghosts or supernatural identities so this is not scary at all. I saw a lady in white in my bedroom walking right past me and in to my closet, so that child in the picture dose not scare me. I took this picture during October 2007, it was around 8:45 pm at the old Fort Duncan Hospital. I have two eyewitness (Tarkin and Fakke) that were there with me when I took more than 10 pictures of the same area. Has this been analyzed? I think this is a very interesting picture. 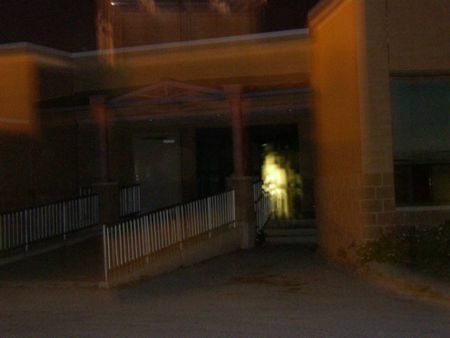 I see two children facing out as if they were exiting the hospital or conversing with the spirits going in. I see few children walking into the hospital as well.